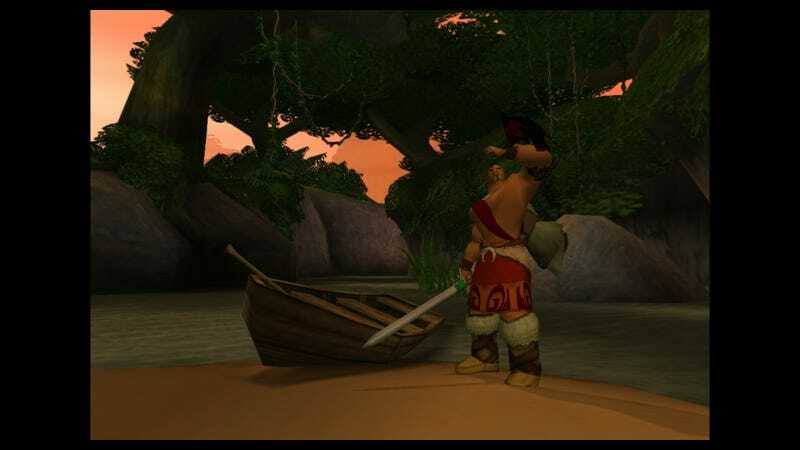 Mark of Kri is one of the few PS2 games downloadable for the PS4. God of What? Final Fantasy How Many? Nope and nope. One week ago, the well-hidden section of the PlayStation 4’s online store where Sony and its partners sell PlayStation 2 games displayed more than 50 titles. Today, it lists just one item, a four-game bundle of Jak & Daxter PS2 adventures. The 50-some games are still on the store. Users who search for Bully or Dark Cloud 2 or Mark of Kri can still find individual listings and can still buy the games for $10 or $15. They just don’t show up in the “PS2 on PS4” section. Ironically, it appears to have happened late on Tuesday, the same day we referenced that page while criticizing the lack of PS2 games added to that page in 2017. It’s unclear if this is a bug or a conscious change by Sony. It is, at least, the latest example of Sony’s infinitesimal support of games for its most popular console on its current one. Until last week, a scroll through the “PS2 on PS4” section told the story of how poorly the PS2 library has been offered to PS4 owners. There is very little from Sony’s own roster of excellent, exclusive PlayStation 2 games. There are no God of Wars, no Gran Turismos, no Ratchet & Clanks and no Sly Coopers. Iconic third-party greats like Final Fantasy X, Metal Gear Solid 3 Silent Hill 2 and Katamari Damacy are missing, too. Instead, Sony has been offering a clutch of the odder though admittedly sometimes excellent PS2 games it published: the likes of Siren, Rogue Galaxy and Twisted Metal: Black. Glitch? As of last Tuesday, Sony’s well-hidden “PS2 on PS4" corner of its online store only lists one title. The other four dozen PS2 games available for PS4 are in the store, but not in this section. The roll-out of PS2 games for PS4 started two years ago and has recently been slowing down. About a dozen PS2 games were released on PS4 in the last two months of 2015. A couple dozen more were added in 2016. Through 2017, however, just 13 more PS2 games went on sale. That includes the Sony-published Jak II, Jak 3 and Jak X: Combat Racing, which were added to the shop this month. The only other Sony-published PS2 game released for PS4 in all of 2017 was released in August. And it was the first Jak game. We wanted to talk to Sony about what went wrong with its PS2 section on the PS4 store, but it has not provided comment. We told the company we’d love to talk about its overall approach to offering PS2 games. If Sony bites, we’ll let you know. For the last several years, Sony’s rivals have been pushing downloads of a lot of their older games. Nintendo has taken a pause of that with Nintendo Switch, but its Wii, Wii U and 3DS machines all features purchasable downloads of games from older Nintendo consoles and handhelds. Microsoft has been selling numerous older Xbox 360 and original Xbox games for Xbox One and has been diligent about ensuring that its early Halo games, for example, remain playable on its newest hardware. Sony has been less aggressive with selling its PS2 library. The company’s previous console, the PlayStation 3, originally played PS2 discs. But by the third year of that system’s life-cycle, the feature had been dropped from newer models of the machine. Sony eventually released several dozen “PS2 Classic” games for download to PS3, including the likes of Katamari Damacy and God Hand, which have not made it to PS4. You can’t download the original Shadow of the Colossus from PS2 for PS4, but you could by a polished port of the game on PS3 and will be able to get a full remake for PS4 in early 2018. The PS4 seemingly can run a wide range of PS2 games, but Sony barely sells any. PS2 game discs don’t run in the system, but downloadable versions of some of these games do. If there is a hardware limitation keeping others from running, why not use streaming? Sony’s game-streaming service, PlayStation Now, lets paying subscribers access hundreds of PS4 and PS3 games but offers no games from the PS2 (or original PlayStation for that matter). While Sony hasn’t offered many of its PS2 games for download or streaming, it has at least shown interest in repackaging them, polishing them, and selling them in bundles that can be boxed and listed for close to full price. The cessation of PS2 backwards compatibility on newer PS3 models gave way to a raft of up-rezzed PS2 classics bundled and sold for closer to the full price of a modern game. With that approach, Sony sold PS3 owners a combo pack of Ico and Shadow of the Colossus, a triple-pack of Ratchet & Clank games, and a pair of God of Wars. It’s not quite the same thing, but Sony’s next big release for the PS4 is February’s full-on remake of Shadow of the Colossus. Last week, some people did notice the weird change in Sony’s obscure “PS2 on PS4” sub-section of the PlayStation Store. Discovering the change, one user of the GameFAQs message board started a thread titled “The PS2 on PS4 games are gone!” Another user pointed out that it was “probably a store error.” After all, the games weren’t gone from the store, just from that not-very-convenient page. The person who started the thread wondered if they’d missed some news. For better or worse, they didn’t. There is no news about Sony’s PS4 support for PS2 games. The big news would be that Sony has gotten serious about selling its PS2 games to a modern audience. (And, for that matter, PlayStation 1 games.) That’s something that, four years into the lifespan of the PS4, complete with its backwards-compatible streaming service, we are still unable to report.